Jack Collison on his Posh debut against former club West Ham. Photo: Joe Dent/theposh.com. Peterborough United manager Dave Robertson was a very happy man after his side fought out an entertaining 3-3 draw with Premier League side West Ham at the ABAX Stadium today (July 11). Posh were 3-1 down midway through the first half, but goals from Jon Taylor and Michael Bostwick, from the penalty spot, earned a draw. Ricardo Santos had opened the scoring in the opening 10 minutes. Robertson was delighted with his side’s character and the fact they have now scored six goals in their opening two friendlies of the summer. Posh won 3-2 at non-league Dulwich Hamlet on Wednesday (July 8). Posh also saw new midfielder Jack Collison, a former West Ham player, make his debut as a late substitute. Robertson said: “I think the opening two matches have shown that we intend to play attacking, entertaining football this season. We scored a couple of well worked goals today and, although a couple of the goals we conceded were poor from our point of view, overall I am very happy with where we are as a squad. “If we are to get promotion this season we will have to perform against the best and we came through a very difficult test against a strong West Ham side. “I was pleased with the way we approached the game. We were ‘football brave’, we executed our game-plan well and we competed for 90 minutes against very strong opposition. “The second goal we scored was excellent and the sort of move we have been working on. It’s a good result for us and most importantly another good work-out and most of the squad now have 90 minutes under their belts. Midfielders Harry Beautyman and Joe Newell, plus striker Kyle Vassell should make their seasonal bow in Wednesday’s (July 15) friendly against Cliftonville in Belfast or next Saturday’s (July 18) game at home to a Spurs XI. Robertson insists his players are in for arduous week in Ireland when work on defensive shape will be a priority. 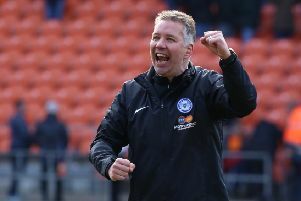 The manager has fewer concerns about the Posh attacking play and he is already excited with the new strike partnership of Conor Washington and Joe Gormley, even though neither scored against the Hammers. “Their partnership is well under way,” Robertson added. “They are already good friends off the pitch and they have struck up an understanding on it. They combine well, they are always looking for each other and to be honest I wouldn’t like to be a centre back in League One facing these two. Gormley won the sponsors’ man-of-the-match award today. Posh fielded two triallists, but refused to confirm that the players concerned are Kieran Sadlier and Andrew Fox. They will both travel with Posh to Ireland tonight.